What a grand place to cook! Yes, yes, I know. Bad rhymes again. But every time I walk into the kitchen I feel like singing (and dancing on the checkerboard floor). We’re getting close to the drum roll, but not yet. Still no stove. Still no French doors. But we redded up the place on Saturday in preparation for visitors — it is spring after all — and it looks almost like a real kitchen. This is the built-in floor to ceiling spice rack. The bottom shelves are larger to hold olive oil and larger bottles. His mom is an artist, and I was so pleased she noticed the kitchen windows. For outside the windows is the green green grass of spring, and inside the windows on the wall is Blooming Grove green. The inside green and the outside green are separated by the creamy white of the windows, and I love it. I can’t manage a photo of it though. When I take a shot of the grass outside, the inside green is too dark; when I take a shot of the interior walls, the outside blurs. If someone out there in readerland is a photographer and can tell me how to do this, I’d be happy. In the meantime, you’ll have to look at these two photos and pretend. We’ve also put wainscoting on the short wall that flows out to the peninsula between the living room and dining room. We’re still working on the rest of the wall as it turns the corner. 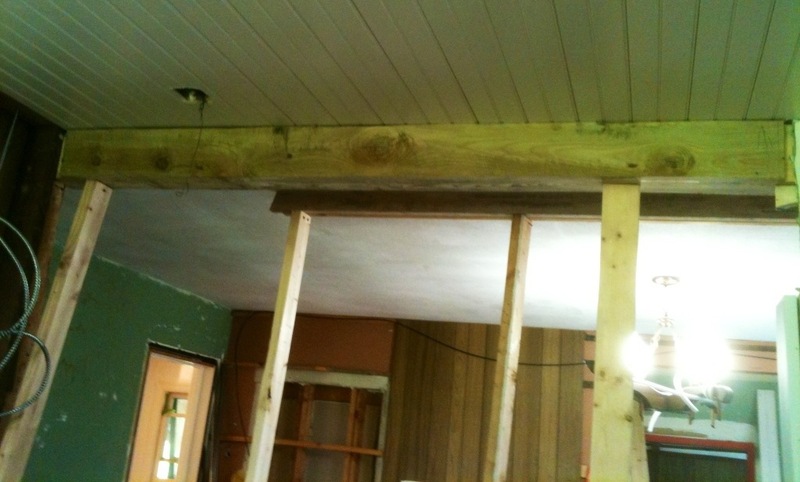 The beam that separates the two rooms has to go up first. This is good because it means that we can finally get rid of these 2x4s that we’ve been walking around and through for the past year. We’ve put the island back in place. A dark oak cupboard will go on the wall next to the green door. We actually ate dinner in the kitchen on Monday night — on stools around the island — even though the stove is still in the living room. It was still a little too cool to eat on the porch, but it is ready for spring. And so am I! Give me a gray, rainy day in spring over a sunny day in winter anytime! beautiful kitchen! they enjoyed their visit as well! I’m so glad; they are great people. Never have we wished so much to be able to communicate better! Great update! love that color green! The island is beautiful! I love it too! It’s a happy green. It is looking fantastic Carol. Love the green. Thank you both Nancys — (is plural of Nancy Nancies?) :-) I’m glad I spent time on that green, cause I do love it! I love that cheerful green with the checkerboard floor!